Last week we announced Pandemic 10th Anniversary. You can read our full announcement article here.There’s been a lot of excitement and speculation surrounding the announcement, so we wanted to expound a bit on a few key topics of interest. Q: Will this version of the game be available beyond the English-speaking market? These localized versions will also be limited based on each market's size, so if you really want Pandemic 10th Anniversary in one of these languages, act fast! If you have an option to pre-order, that would be your best bet to secure yourself a copy. Q: Is it for sale only through the Z-Man website? A: No. Pandemic 10th Anniversary will go through our normal distribution channels. We are running a pre-order offer through our website where you receive one set of pre-painted figures for free when you pre-order (for more details see the original announcement here). Q: Will it be available for a limited time only? A: It has been printed in limited quantities, so it will be available as long as supplies last. Q: How long will the pre-order be open? 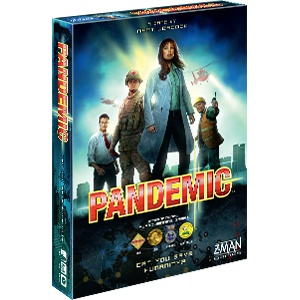 A: We’ll be accepting pre-orders of Pandemic 10th Anniversary all the way up until the release date. The promotional painted figures are available while supplies last; we'll post updates on availability on our website. A: Pandemic 10th Anniversary will be releasing in late 2018. Stay tuned to our website for more articles and updates as we get closer to the release date. Q: How large are the figures? A: The bases are 16mm in diameter and the height of the figures ranges from about 40.25mm (the Researcher) to 46mm (the Operations Expert), including the base. As you can see in the picture below, the figures are taller than the original pawns. Note that the bases and pawns are very similar in their circumference, making their footprints nearly identical on the board. Q: Are the figures painted? A: The figures that come in Pandemic 10th are painted with an ink wash, which is a technique that uses a diluted dark color that is brushed over the figure and easily seeps into the recesses. This gives the figures a very dynamic look, accentuating the detail without any additional painting required. We are also offering fully painted figures as a special pre-order bonus. 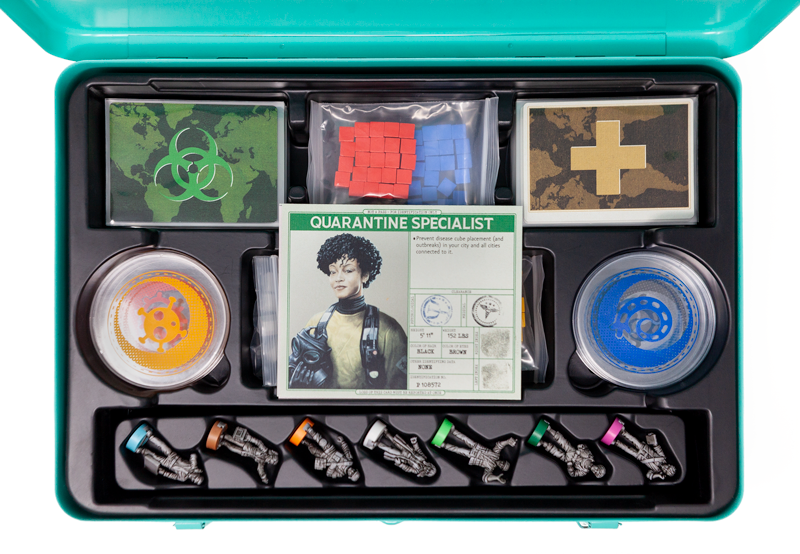 While supplies last, if you pre-order the game, you will receive the fully painted figures in addition to the washed figures that come inside Pandemic 10th. Read more about the fully pre-painted figures. Q: Can I get the pre-painted figures from my local retailer? A: The pre-painted figures will be available to retailers while supplies last near the release of Pandemic 10th Anniversary, so be sure to ask your local retailers to order it. Q: How large is the board? A: The board is 30” x 17”. 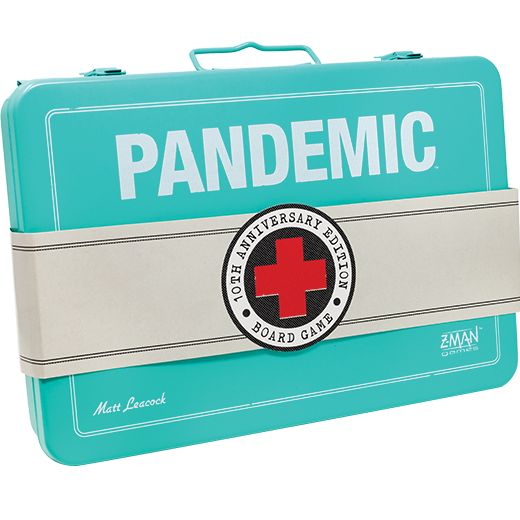 It’s 150 square inches larger than the 2nd edition board, making it a similar size to the Pandemic Legacy boards. The larger size shows off the new art and is befitting of this special edition. 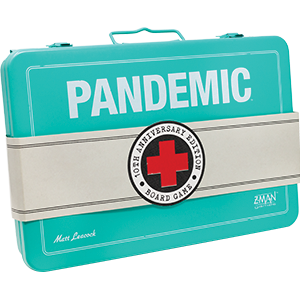 Q: When I play Pandemic, I typically like to include expansion content (On the Brink, In the Lab, State of Emergency). Will I be able to play expansions with this anniversary edition? A: Several expansion modules use components that do not get mixed in with existing base game components, so those can be used with Pandemic 10th Anniversary. If you wish to play one of the expansion modules that integrates new cards into either the player deck or infection deck, the best option would be to set aside the anniversary cards and instead use your existing player and infection cards. This allows you to use the majority of the anniversary edition components while still enabling you to play with some of your favorite expansion content that you already own. Some of us here at the studio are planning to save our anniversary cards as our “teach-new-players-the-game” set and leave the expansion content shuffled in with the base game; that way we don’t have to bother with hunting for icons in the corner of cards, plus removing and sorting. Q: Will you release anniversary versions of the expansions in the future? A: This release coincides with the base game's anniversary. However, depending on the demand, we might consider making expansion content available in this style to match Pandemic 10th's aesthetic. Q: How big is the box? What’s it made of? A: Box dimensions: 14” (w) x 9.5” (h) x 2.5” (d). The box is made of steel. It’s evocative of heavy-duty field medical kits and has a very sturdy feel. It also features two clips, so you can even hang it on your wall if you like. Q: If I sleeve the cards, will they fit in the vac tray? A: Yes. We recommend using sleeve FFS05. Sleeved cards will fit comfortably in the tray. Q: I already own all the Pandemic expansions. 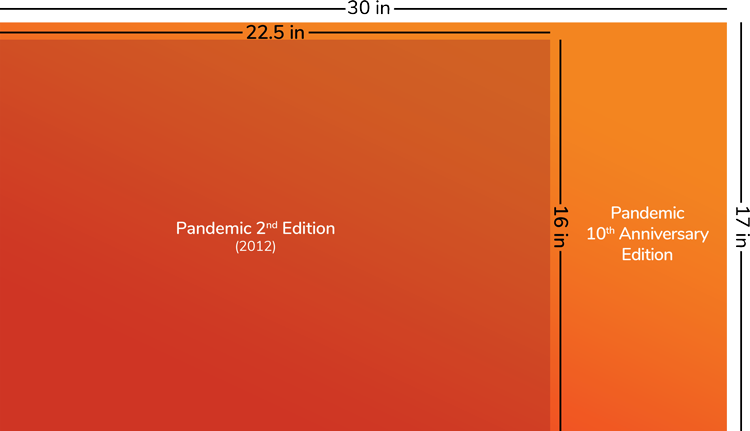 Is there room to store my entire Pandemic collection in the box? Note: The Lab board, the Hinterlands boards, and the Bio-Terrorist tracking sheets must be stored separately. Option 3: Sleeved or Not, Who Needs a Tray? Our creative team painstakingly engineered the tray to be as utilitarian and flexible as possible, but we realize that some people prefer to remove trays from their boxes. If this is you, remove the tray and carefully stack the cards and pieces from the expansions into the Anniversary box. You may want to keep the smaller tray for the figures to protect them, but that’s up to you! Q: Why did you choose to make the cubes wood instead of plastic? 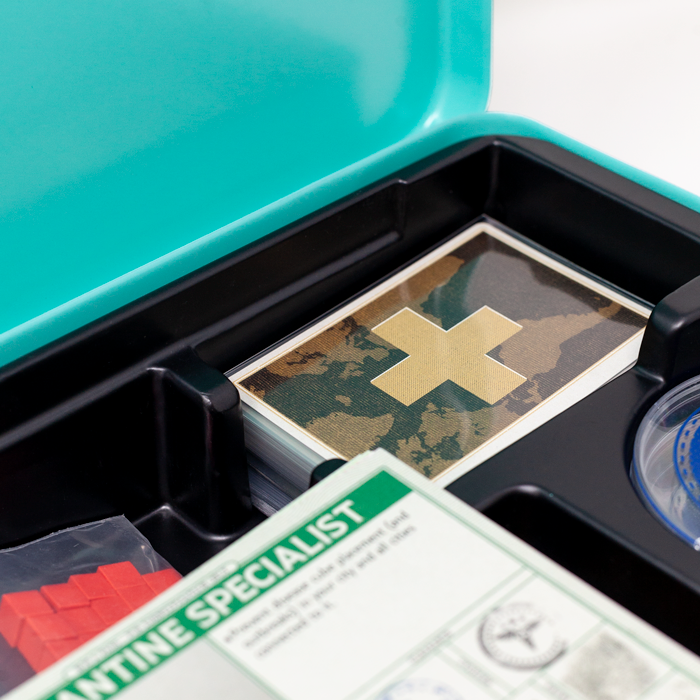 A: The 1st edition of the game used wooden pieces, and with this special edition we wanted to pay tribute to Pandemic’s roots. Also, high-quality wood is an expensive, premium component that we felt fit in really well with this kind of special edition product. Q: How big are the large ID badges? A: 5” x 4”. Each ID badge also has the action reference chart on the back. To claim your copy of Pandemic 10th Anniversary, click here to pre-order.